As a journalist, I spend the majority of my time speaking with public relations professionals. Sometimes, it’s a pleasurable experience, and we both get the information we want and need. Sometimes, people in public relations are extremely rude, which led to my impassioned blog post on rude public relations professionals. I first heard of Kelly Kitchens while working on the Top Women Owned Businesses List for the Dallas Business Journal. She was unlike any other professional I had worked with to that point, getting the information I needed almost immediately, and was courteous and kind the whole conversation. I looked her up and realized I had to hear more of her story. Kelly had wanted to write for magazines, emphasizing in fashion and film. She had expected her studies would lead to her dream job at Vogue on the noble mission of starting a new plus-size section. 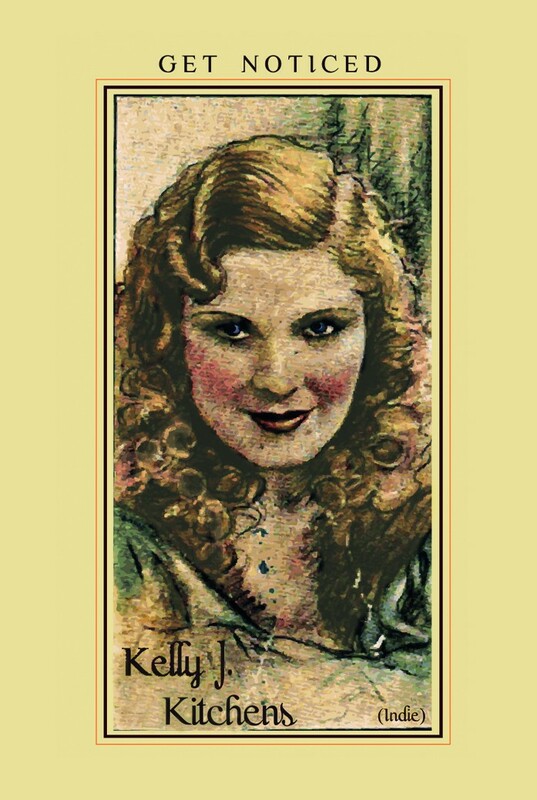 Kelly went on to explain her love of film and working in entertainment PR by explaining her love of old movies, as she pulled out a stack of cigarette cards from her purse. With each historic card, she tells a story. Then, Kelly Kitchens showed the second to last card, and the most significant in her deck. 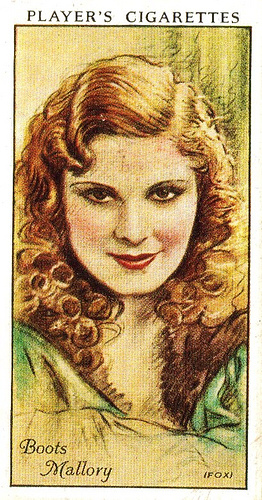 The card featured the beautiful face of Boots Mallory, circa 1934. “When I saw this one, I thought: Oh my gosh, she kind of looks like me. So I had my designer make my card turn her eyes from brown to blue and was like, that’s me! That’s me in 1934. I’ve aged well, haven’t I?” Kelly joked as she showed me her business card for the before and after effect. After pausing to recover from the laughter, she continued her story. “When my professor, who I don’t think is at North Texas anymore, was insisting that I really need to go into news reporting instead of feature writing. I decided to not be a journalism major anymore,” Kelly said. But what she thinks is so weird is that after graduating, all she’s ever done has been in journalism. I took particular note of this because this is not something you’d expect a public relations professional to say. Kelly graduated from UNT in 1991 and did not move on to a master’s degree. But she could not escape college journalism. “In the early ‘90s, there was a magazine, it was a rag really, meaning that it didn’t have any umph to it. There was nothing noteworthy about it really. It came out of SMU,” Kelly said. To Kelly, the paper lacked substance. It was void of anything worthwhile, and primarily written about sororities and fraternities. When the publisher, who was still a student at Southern Methodist University, wanted to expand the paper at UNT, she did a mental SWOT analysis before seizing the opportunity. Kelly went on to explain some of her trials in public relations by explaining some brief Dallas media history. The covers of the Dallas Observer went from covering bands to covering the mayor, or some other citywide scandal. “So people were saying to the publisher of The Student Voice: You should take this paper city wide,” she said. So that’s when Kelly decided to help take The Student Voice citywide and started covering all North Texas. It became a weekly paper like the Observer but was strictly arts and entertainment and nothing else. It was called The Met. As one of the founding editors of The Met, Kelly was the calendar editor and the film editor. “Anybody who had anything to do with arts or entertainment in the North Texas area had to contact me to be in the paper, and everyone wanted to be in our paper because we were fun,” Kelly chuckled. So Kelly left The Met on March 31, 1995. For the disheartened youth, consider this. Kelly started her business before she had an email address. She was writing press releases, faxing them, and mailing them out (or hand-delivering them all across DFW). Her business started to boom until September 11, 2001. Kelly can teach Dallas public relations students and professionals what it means to be in entertainment public relations. Posted in Editorial, JOUR5350 and tagged business, dallas, history, interviews, journalism, media, public relations. Bookmark the permalink. An applicable post from my personal website.